Yesterday I received in my mailbox the first edition of the magazine “Neuromarketing Theory & Practice”, published by Neuromarketing Science & Business Association. 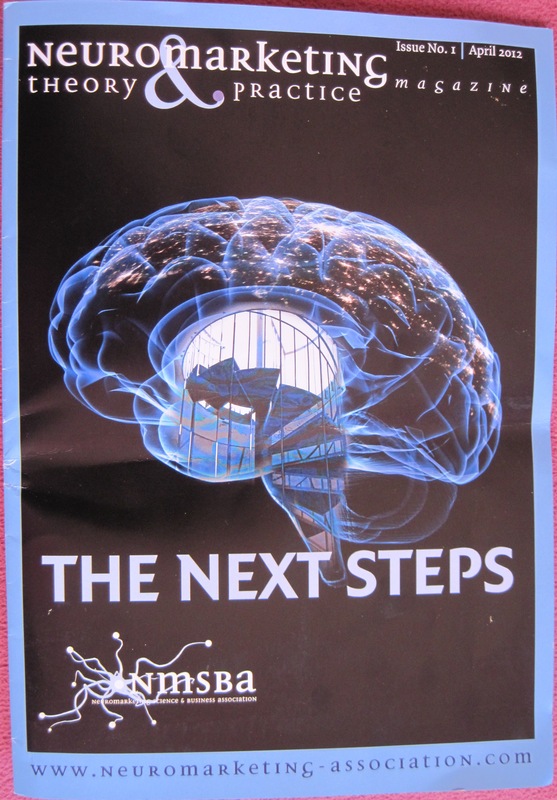 The first issue’s title “The Next Steps” covers perfectly its content, and as Carla Nagel (Director of the Neuromarketing Science & Business Association) says, its members that “share the interest in a field that will definitely change the world” would like to use this theme “to address the steps that lay ahead for the association and the field of neuromarketing after the fabulous first edition of the Neuromarketing World Forum in Amsterdam”. The magazine covers topics that combine science with business and this first issue settles the next steps that should be taken into consideration and implemented. It presents in detail the first Neuromarketing World Forum, the members of the new board of the association and their aim (which includes working on ethical guidelines, standardization, education and sharing knowledge) and much more info of interest for neuromarketers, including details about the second largest advertising agency in Japan, shopping behavior insights and data interpretation of neuroscientific research from Dr. Stephan Sands (SandsResearch) and a book review of Brainfluence (by Roger Dooley) that I wrote. It also contains a research article on ethics in neuromarketing research from Cristophe Morin (CEO SalesBrain), how to understand consumers at a physiological level in order to better target product development and insights from Prof. Diana Derval (DervalResearch), and so much more, which you will discover by yourself reading the magazine. I truly appreciate the efforts made by the Director of the association (Carla Nagel) and it’s members for having this magazine and I am looking forward to the next edition and for the developments in the field. The magazine is under controlled distribution, to the NMSBA Members only. So, if you would like to subscribe (NMSBA Membership, 4 issues of the magazine, access to an international network of neuromarketers and a say in collective guidelines and ethical codes), you should register on the website (http://www.neuromarketing-association.com/join) or send an e-mail to secretariat@neuromarketing-association.com. Subscription is 299 EURO per year.